Does a CMO need an MBA? The Legal Marketing Association's monthly publication Strategies asked this question of three experts in the February 2010 issue. It's a great question, particularly as the legal industry evolves before our eyes. Does a graduate degree in business management (an MBA) help a chief marketing officer (CMO) do his or her job more effectively? Two respondents offered similar responses, essentially "It depends." They suggested that while an MBA may not be essential today, it can be a differentiator in a CMO search in which one candidate has the credential and one doesn't. They also suggested that one's undergraduate degree matters, and if you don't have sufficient business training, get some. As one stated, a business-oriented degree may obviate the need for an MBA, but someone who "spent your college years dissecting frogs or analyzing Mark Twain's literature" may have a greater need. I love that line. It may seem snarky, but it reflects the reality that some degrees confer specific skills (e.g., accounting, chemistry) and others provide wide foundations for critical thinking (e.g., many liberal arts degrees). My own liberal arts undergraduate degree provided an excellent foundation for critical thinking and future learning, and my days climbing the corporate ladder provided daily business lessons, but my MBA provided specific training that has proven to be invaluable in my career. Given the choice to approach it differently, I wouldn't. An undergraduate liberal arts degree and a graduate degree in business has, for me, turned out to be a successful formula. One expert, however, asserted that a CMO has no need for an MBA. "Having obtained an MBA myself and having hired MBAs for an investment bank, I can tell you that very little of what you learn in B-school is of value to a law firm." Wow. I can think of few opinions that are more poorly informed than this one. Good thing this expert isn't influential in the hiring of CMOs! Oh wait, as it turns out, this expert is a recruiter, specializing in placing marketing professionals at law firms. No wonder there are real questions (here and here and here) about the value of CMOs in the modern law firm! Let's not kid ourselves, folks. While there are many fantastic law firm CMOs, there are some whose skills and experience would barely qualify them to be a mid-level marketing manager in the corporate sector. Scroll back up and click on the link embedded behind "CMO" at the end of the first paragraph. Look at the spectrum of responsibilities typically associated with a corporate CMO. How many law firm CMOs own the product roadmap, i.e., have primary input into which practices the firm will offer? How many have any input into setting fees, let alone own the entire pricing process? If we consider the lawyers' business development efforts to be the sales function of the law firm, how many CMOs have responsibility for establishing how the lawyers sell and to whom? Your first reaction may be that many law firm leaders don't even know what these things mean. Therefore, according to our supposed expert, it's a waste of time for a CMO to have skills that the lawyers don't understand. This is nonsense and the expert should be embarrassed to be associated with such drivel. If the lawyers knew all that they needed to know about running a business, then the legal sector would have been better prepared to weather the recent global economic meltdown. 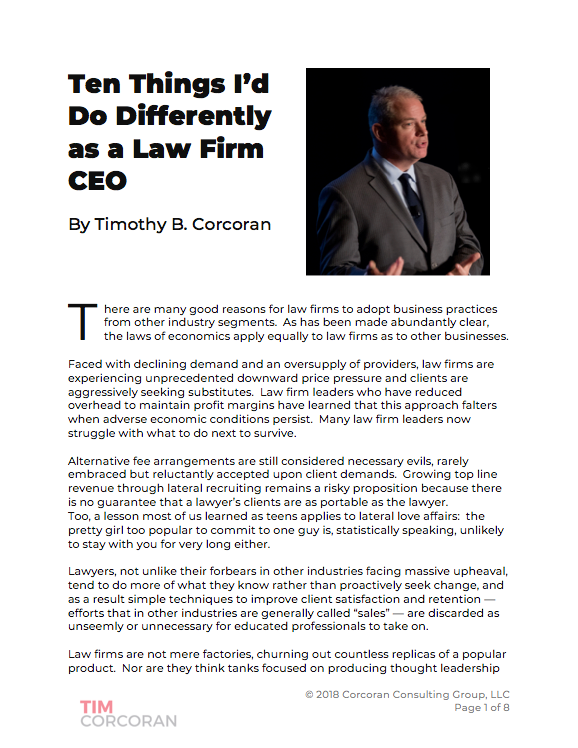 I've participated in and observed the legal marketing profession from many angles, and while the profession has come a long way, the next frontier is to adapt successful business practices into the operations of a law firm. One way to get there is to continue to introduce marketing professionals from outside the legal sector who have business experience, and another is for excellent legal marketers to continue their own business education. It's critical to raise the bar and make the role of law firm Chief Marketing Officer more challenging, and also more rewarding. Today's CMO is expected to manage budgets, manage managers, be conversant in the many critical functions such as communications, public relations, competitive intelligence, web marketing, client relationship management, knowledge management and have a more than passing understanding of strategy, accounting, corporate finance, project finance and leadership development. While one can gain quite a bit of insight and training in these areas without an undergraduate business degree through on-the-job exposure, I'm a firm believer that an MBA provides new tools, techniques and a vocabulary that are difficult to replicate in a piece-meal fashion. But as the first two experts offered, if you don't have this training, do something to get it. Recruiters who recirculate the same resumes, who rank longtime law firm experience as far superior to business experience or business training, are doing a disservice to the legal marketing profession. They pander to the law firm leaders who don't know any better, and who are comfortable with marketers who know how to "keep the trains running on time" without "rocking the boat." When I was an in-house law firm marketer I was recruited constantly to jump to another law firm. When I heard the recruiter repeat these code words, which to me mean "don't challenge the lawyers to change," I ran the other way. For me, and a for a lot of excellent legal marketers I know, being seen and not heard while churning out "brochureware" at the request of lawyers who think this is how clients buy, is not an inspiring role. Many law firm leaders out there today are realizing that what made the law firm successful in the '90s and '00s is no longer enough to succeed in the next decade, and they accept the challenge to improve their operations. Part of their challenge is finding and hiring experienced professionals who bring new ideas, ideas tried and tested in other environments, and giving these professionals a voice. I imagine that the influx of new ideas from outside the legal profession, and the excellent ideas offered by legal marketers who have improved their business acumen, will easily crowd out the supposed experts who wish for a return to the heady days of yesterday. That door is closed. Please don't let it hit you on the way out.